Designed to seamlessly integrate with the S9™, the H5i™ heated humidifier offers relief from dryness and congestion. The H5i is incredibly simple to use. The S9 automatically detects when the H5i is connected. Once you have connected your H5i you are ready to go. The standard tub is a one-piece tub that is designed to be replaced every six months. The cleanable water tub is easy to disassemble, clean and reassemble. 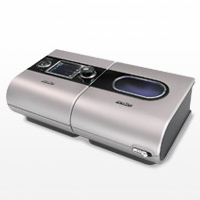 It is also suitable for multi-patient use in a clinic, hospital or sleep lab.